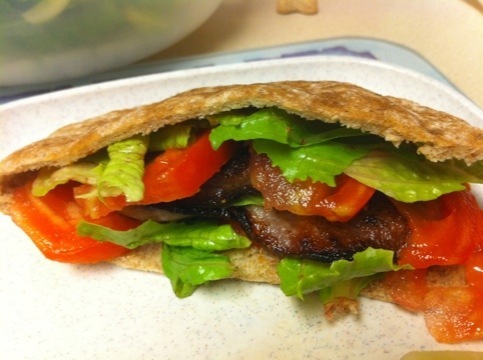 The CBLT is also a healthier choice because whole wheat pita bread is used instead of white. Simply stuff the pita with crispy Canadian bacon, lettuce and tomato and drizzle red wine vinegar and you are good to go! What is your favorite healthy lunch when you are on the go? LOL Since you are a foodie you might like one of the sites of a customer of mine! http://diettogo.com/ I have had their double fudge cupcakes and they are awesome! Never believe this is diet food by the taste. thanks for the tip! sounds delicious! I love making diced cucumbers, diced tomatoes and grilled chicken with fat free Italian dressing!! Healthy little non-traditional salad! 🙂 I am going to try this one though for lunch next week!!! YUM! !